Sense International’s recent ‘My Turn to Learn’ appeal raised over half a million pounds – including a £216k contribution in UK Aid Match funding from the Government. The global charity will use these donations to deliver a pioneering programme that will improve access to education and opportunities for work for children and young people with deafblindness. The global deafblind charity, Sense International, will begin a pioneering programme to transform the lives of children and young adults with deafblindness in Bangladesh. It follows a successful appeal that raised £521k from the public – including a £216k contribution in Aid Match funding from the UK Government. 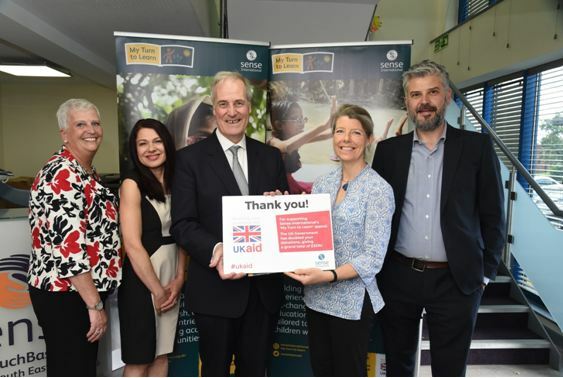 The Minister of State for International Development, Lord Bates, visited TouchBase South East, a Sense run day-service in Barnet, UK, for the announcement. The Minister toured the service, and met staff and service users to learn more about the support Sense provides to individuals and their families. Sense International will work with local partners in Bangladesh to improve access to education and opportunities to work for children and young people with dual sensory loss in the country. The programme will recruit and train specialist teachers who will work with families to support the children at school; training for mainstream teachers; the creation of a model school to promote best practice; and targeted meals so that children with deafblindness are well enough to learn. Less than ten percent of children with a disability in Bangladesh are in primary school. It is rare for children with deafblindness to be included, often because teaching staff don’t have the skills to support them and families are overwhelmed by the emotional and practical challenges. Without access to education, children with deafblindness remain at home, and do not develop the vital communication and life skills they require to achieve basic independence. “Currently, children with deafblindness in Bangladesh rarely get the opportunity to learn vital communication and life skills, leaving them isolated and at greater risk of poverty. “I’d like to thank all the generous supporters of Sense International’s ‘My Turn to Learn’, UK Aid Match appeal. The UK Government matched eligible public donations to the My Turn to Learn appeal – through its UK Aid Match scheme. UK Aid Match, which is run by the Department for International Development, brings charities, the British public and the UK Government together to collectively change the lives of some of the world’s poorest and most vulnerable people.